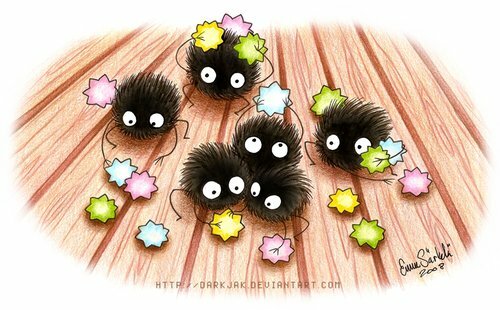 Soot Sprites. . Wallpaper and background images in the A Viagem de Chihiro club tagged: studio ghibli spirited away hayao miyazaki. This A Viagem de Chihiro photo contains buquê, corpete, posy, nosegay, corsage, ramo, rosa, rosiness, and vermelhidão. There might also be camélia, camelia, camélia camélia, begônia, rosa, roseira, and rosebush.